The Meta tags on your webpage are essentially you telling the search engines a bit about your page to help them determin rankings. Meta tag infomation isn't displayed 'on the webpage' - but they still count towards on-page criteria since they are part of the page. To view the meta tag infomation, you need to view the html - the page source. 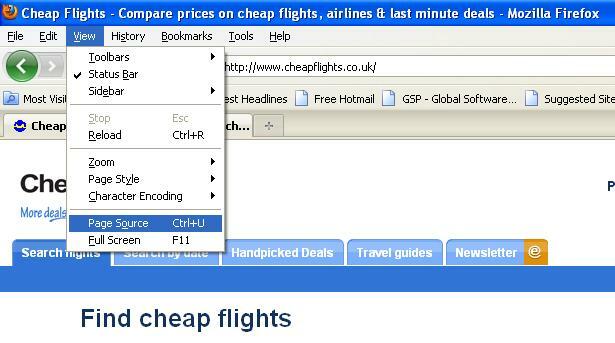 To view the source for cheapflights.co.uk, go on your browsers toolbar click on ‘View’ and then select ‘View Source’. This is the html code for the page you are viewing. If you’re unfamiliar with html – relax! The simplest, most important bit of interest is the meta title, meta description and meta keywords. ** If you can, try opening and viewing the source of cheapflights.co.uk (Homepage) through this article. The meta title forms the text line that appears in the top of your browser as well as the title of any search engine results for that page. The meta description usually forms the search engine results description, although not always. For more specific searches, they may extract copy from the body of your pages and display that instead to improve the relevancy of your results. The meta keywords are simply you stating which words you would like to be found for. Early SEO simply meant spamming the meta data with information to achieve traffic. Search Engines have developed and are always looking to improve the relevancy of their editorial search results, leading some ‘SEOers’ to give up on meta optimization altogether. Search Engine optimization must be consistent across the board in order to provide maximum relevancy. Some say that search engines disregard meta tags today – YouTube is the world’s second largest search engine and cannot search it’s own content. It relies almost exclusively on titles and tags for on-page ranking criteria. In my experience, adapting the keywords in the meta descriptions have changed results. For peace of mind I put as much effort into meta tags as anything else. Think of search engine optimization as a cake; if you’ve got the best flour, best butter, best icing, an awesome recipe to bake it – but bad eggs, then it’s going to taste pretty shocking. Don’t compromise yourself, and pay attention to meta tags! Consider the keywords first. 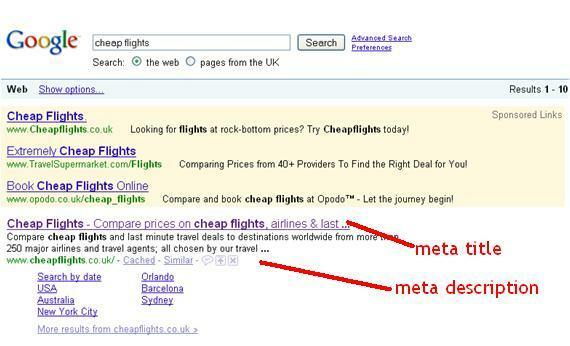 Notice that ‘cheap flights’ is the first keyword (each keyword as a whole is separated by a comma + single space; a single keyword can consist of multiple words). After cheap flights, there are a number of related keywords such as compare flights, cheap flight (notice the use of a singular), flight deals – all orientated around the same theme. You can expect when searching any of those terms to get a comparison website. Notice again, that they don’t keyword spam – and that there are not hundreds and hundreds of related words. The best strategy is to ‘target’ a select group of keywords and use them in your meta keywords box and on page. The meta title includes the main page keyword first (search engines read from left to right, and putting this first ensures that search engines have to read this first and already know what you’re on about. The rest of the title incorporates the human elements – what the website is about, whilst also including some of the related keywords from the meta keywords list. ** but three, strikes and you’re out! Keyword manipulation is a big no-no. Give a guide to the search engines, but don’t try and trick them. It’s all about building credibility with search engine optimization meta tags. If you want more tips and techniques for search engine optimization meta tags, why not sign-up to my free web bulletin and get exclusive interviews and articles (plus a few free bonuses) straight to your inbox?